The history of the Yangtön lineage is closely interwoven with the history of the Yungdrung Bön tradition itself. It is said that two of Lord Tönpa Shenrap’s disciples were Yangtön lamas. And during the reign of the first Tibetan king, Nyatri Tsenpo in the second century B.C., the official priest for the king and the kingdom was a Yangtön lama. The name “Yangtön” is an abbreviation of the ancient Zhang Zhung family name “Ya Ngal” and “Tönpa” together meaning “Teacher of the Ya Ngal clan.” The original seat of the Ya Ngal clan was at Taktse Jari in Upper Tsang, Tibet. This is where Yangtön Sherap Gyaltsen was born during the Fire Snake year of 1077 AD. Because it was prophesied that he would be an emanation of the ancient lama Pangla Namshen, he was also called by this name. In his youth, he studied under many lamas including the first abbot of the famous Yeru Wensaka Yungdrung Bön Monastery, Druchen Yungdrung Lama. He devoted himself to study and there were no Buddhists who could defeat him in a debate. He eventually became known as “Yangtön Chenpo”, the Great Yangtön. “How much knowledge do you have?” He replied, “I am completely knowledgeable.” At that, the woman became unhappy, and crying, she left. He thought, “When I told her that I was knowledgeable, she became unhappy, If she appears tomorrow, I should tell her that I don’t know anything.” The next day, the woman appeared and asked the same question as before. This time, he replied, “I don’t know anything. Are there any good qualities that you could teach me?” Happy with the response, she answered, “If you want to learn some good qualities, in a cliff of lu and demons, never seeing the sun or moon, lives Ronggom Tokmé Zhikpo. Go there and you will have some great things to learn.” Having said this, she left. Just hearing this, Yangtön Chenpo’s heart was overcome with joy and he neglected to ask where to find the lama. He waited for the woman to appear the next day but she did not return. After a week had passed, he decided that he could wait no longer and that he must go and find this lama. Yangtön Sherap Gyaltsen was the first of his family to leave Taktse Jari. He first traveled throughout Amdo and Kham for three years looking for Ronggom Tokmé Zhikpo, but did not find him. After that, he went to Central Tibet and searched for the lama there for three years, but did not find him. Then, he went to Ngari and searched for three more years, but did not find Ronggom Tokmé Zhikpo. Utterly despondent, he decided to return. When he reached Mustang, he ran into two men who were playing a game of dice. One of the gambling mantras went like this, “Never seeing the sun and moon, the yogi Ronggom Tokmé Zhikpo knows!” Upon merely hearing this, Yangtön Chenpo’s body began to shake. Thinking that it would now be possible to meet with the lama, he became delighted and began to laugh. But then he thought that maybe it wasn’t possible because even though he had spent nine years looking, he hadn’t found the lama. He then began to weep. He asked the two men where the lama lived and they replied, “Below, near Lowo Montang in a cliff of lu and demons, in the upper part of the valley. At this, he went to find the lama. Prior to their meeting, Ronggom Tokmé Zhikpo had a dream in which he was told that an emanation of Pangla Namshen would arrive and that he should give him teachings. The next day, Yangtön Chenpo finally met with his lama, Ronggom Tokmé Zhikpo, and began receiving profound instructions from him. 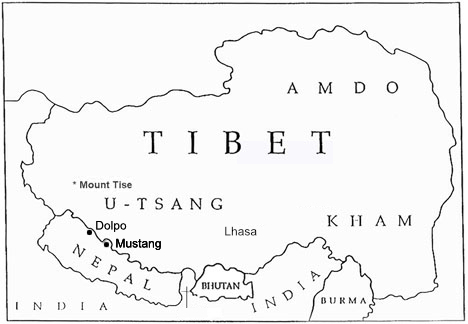 Tokmé Zhikpo gave Yangtön Chenpo the Upper Transmission of the Aural Lineage of Zhang Zhung. Previously, he had received both the Upper and Lower traditions of the Aural Transmission from Lama Orgom Kundrol, teachings and transmissions from the AH Tri Dzogchen from Me’uton Lhari Nyenpo, as well as many pointing out instructions. He had the good fortune to meet with and receive teachings from many lamas. At the Zangri Shar Monastery, he went before the great teacher of the Me’u lineage, Khepa Palchen, for a ritual cutting of his hair and receiving vows. He was known as a teacher who had received the signs of accomplishment for the full development of training in sutra, tantra and dzogchen. In modern times, that would be similar to the title of ‘Geshe’, ‘Lopon’ or ‘Khenpo’. He settled in Gyal Zhug Dong Kar in Mustang, Nepal where he established a hermitage called Kyaru Gon. To some of his disciples he taught the Extensive Aural transmission of Zhang Zhung, to others he taught the medium-length text, and to still others he taught the condensed version of the Aural Transmission. These became three distinct transmissions known as the ‘Upper Transmission”, the “Lower Transmission”, and the “Intermediate Transmission”. He practiced wherever he went and exhibited numerous signs of his realization. With his third wife, he had a daughter and two sons. His sons were named Bumje Ö and Tashi Gyaltsen. They became lineage holders of the Southern Lineage of Transmissions which also included the esteemed Druchen Gyalwa Yungdrung who composed the widely used practice text for the Aural Transmission of Zhang Zhung commonly referred to as the Chaktri. For many generations, both the transmission of the Experiential teachings of the Aural Transmission of Zhang Zhung, and the practice of Zhang Zhung Meri, had become separated from the transmission of the precepts of the Aural Transmission of Zhang Zhung into two distinct Upper and Lower lineage transmissions. Yangtön Sherab Gyaltsen reunited these two transmission lineages and out of kindness towards future students, he wrote down some of the Aural Transmission of Zhang Zhung teachings along with their commentaries. According to prophecy, his life span was to be 75 years long. However, it is said that writing down these secret teachings created an obstacle that caused him to die at the age of 63. From A Mala of Pearls, Invocation of the Yangtön Lineage, translated from the Tibetan by Raven Cypress Wood. Posted on May 27, 2017, in Dolpo, Nepal, Tibetan Lamas, Uncategorized. Bookmark the permalink. 1 Comment. Raven, This is so exciting to read! Your website is such a great resource for anyone interested in Bon. I am always very happy when I see another update from you. Thank you!